One of my favorite type cards in the collection, starring HOF lefty and master of the screwball, Carl Hubbell. There's a little of everything in this photo, from visible spikes to high leg kick to bloused pants to an artistically foggy background. 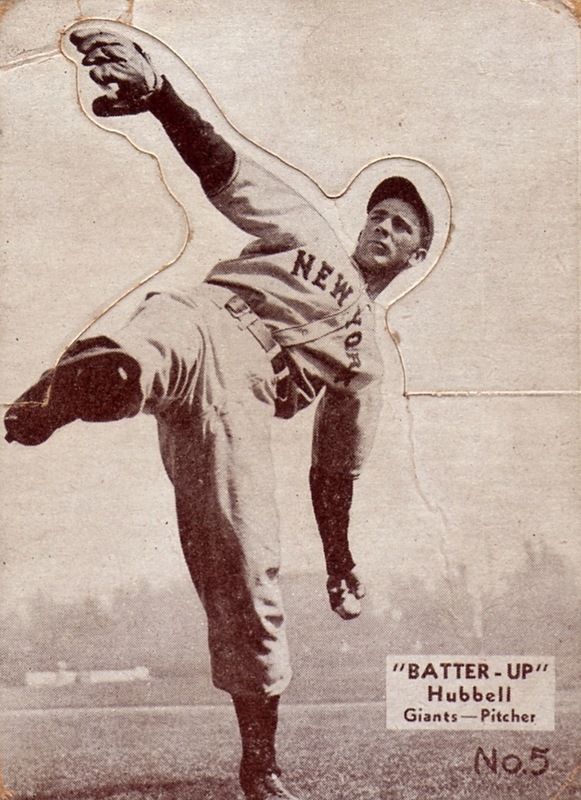 The die-cut edge surrounding Carl's upper half allowed collectors to detach and bend the top at an angle, standing their batters (and pitchers) "up," hence the set name. I bet many kids used them to run through games on bedroom floor ballparks, just as they built blanket mountains for army men or played house with stuffed animals. Batter-Up's 192 cards showed almost everyone in full regalia, often shagging balls or swinging bats. Several, like #101 below, show fielders making catches at full extension. 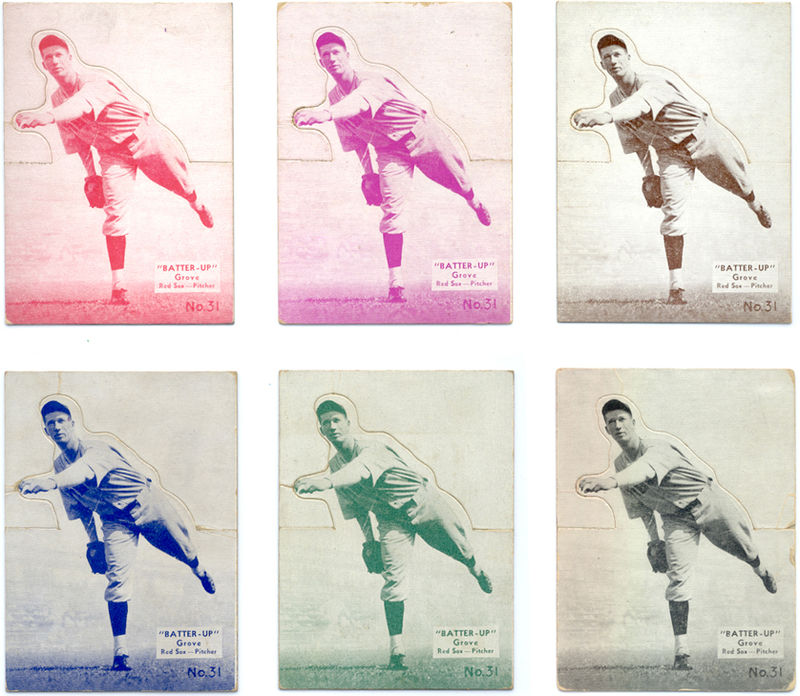 Batter-Up's first series (#1-80) came in several colors, a challenging task for variation or Master Set collectors. The high series (#81-192) cut back to one color, is 1/4" shorter top-to-bottom, and proves harder to find in the market. 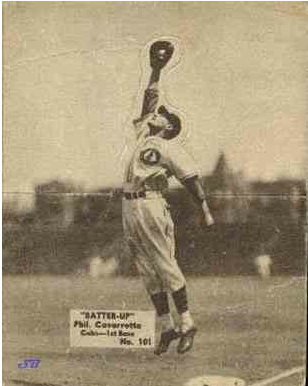 I assume Batter-Up's publisher printed its high series in 1935-36, using proceeds from sales of low numbers. The Batter-Up set missed out on Babe Ruth and Lou Gehrig (1934 Goudey exclusives) but is otherwise full of Hall of Famers (set checklist). It impresses me as the first set with modern dimensions to use player photos as its selling point and I enjoy all the high socks, classic uniforms. and old gloves. TRIVIA: New York retired Hubbell's #11 in 1944, the first Giants player so honored. Value: This HOF #5s runs $10-20 in low-grade (e.g., missing the fold), moving toward $100+ in mid-grade or better. Fakes / reprints: The die-cut makes this set harder to fake and I haven't seen any in the marketplace. Modern sets also reused Batter-Up's full-length and black-and-white design, but those aren't strictly reprints.